One month after launch, Calipso has joined the A-Train constellation of 6 French-U.S. atmosphere-observing satellites. Calipso’s instruments are being checked out and brought into service. The satellite is set to be fully operational in the days ahead and is already beaming back its 1st images. Since its launch 28 April from Vandenberg Air Force Base, California, the Calipso satellite has performed flawlessly. It has now joined the A-Train after a series of 2 manoeuvres on 26 and 31 May to boost it to its assigned altitude slot in the constellation. The 2nd of the manoeuvres raised the satellite’s orbit by 4.611 km, a superb feat of precision (mission planners had specified 4.6 km). The U.S. CloudSat spacecraft, launched on the same flight, will gradually be brought closer to Calipso. With such precise manoeuvres, no further positioning operations will be needed before end August. Calipso’s slot in the A-Train is stable and the constellation—Aqua, Aura, CloudSat, Calipso and Parasol—is almost complete, with just Oco left to launch in 2008. Calipso’s scientific instruments were turned on even before the satellite reached its final orbit. The Imaging Infrared Radiometer (IIR) and Wide Field Camera (WFC) are already working. The laser, the main critical payload component, has already functioned at full power and is ready for the lidar—the main payload instrument—to begin routine science operations in a few days’ time. Calipso’s data are most awaited of all. Its lidar, equipped with a 1-m-diameter receiver telescope, will provide vertical profiles of the atmosphere, day and night, from the Earth’s surface up to an altitude of 40 km. While these measurements are expected in early June, Calipso has already sent back its 1st images from the IIR only days after launch. IIR data will complement those acquired by the lidar, especially for night-time measurements. These data will be used to calculate ice particle sizes in certain types of cloud. 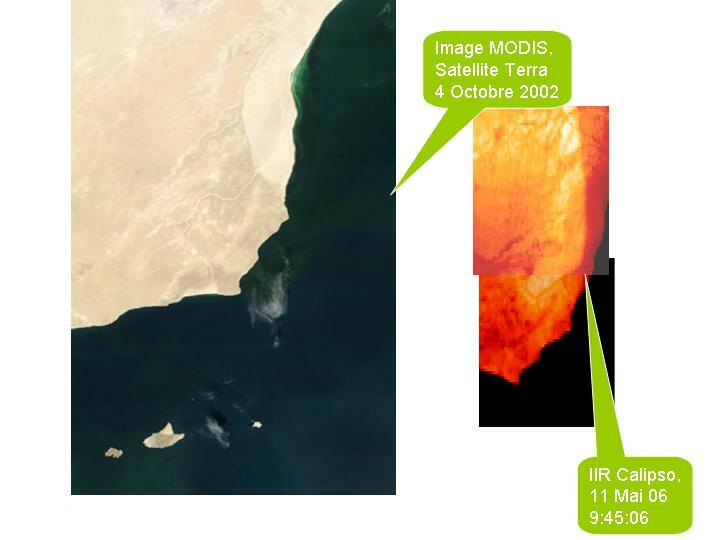 Comparing images from Modis and the IIR. The rivers (image 1) and the slopes (image 2) appear clearly. Credits: Nasa for the images Terra/Modis and CNES for the images Calipso/IIR. 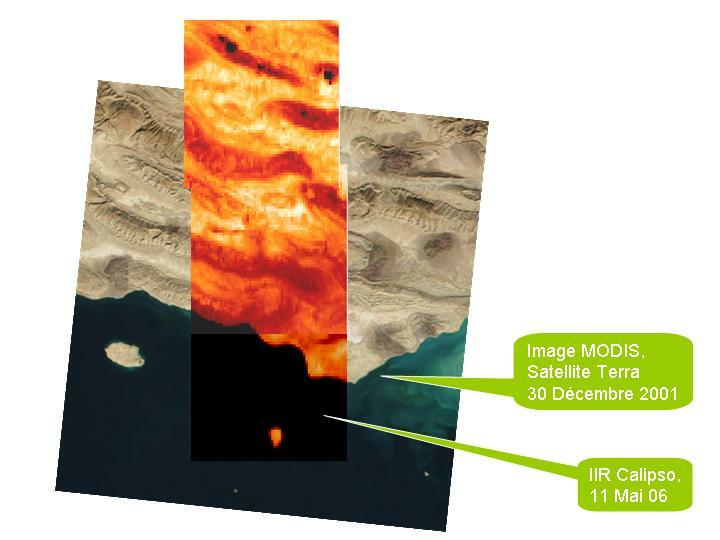 IIR images will also be compared with results obtained by the Modis multispectral radiometer on the U.S. Aqua satellite. The WFC, Calipso’s 2nd instrument supplied by Nasa, has also returned its 1st image. This camera acquires high-resolution images centred on the lidar footprint. 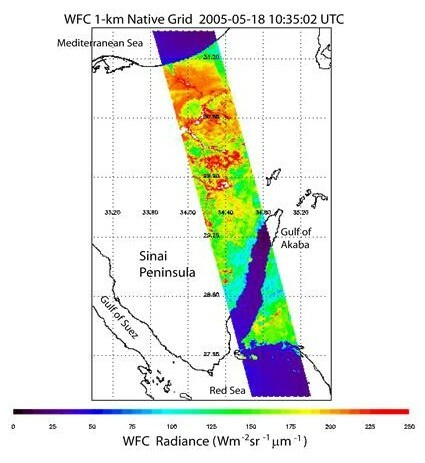 Together, the IIR and WFC instruments will complement lidar measurements. All these measurements will give scientists a clearer idea of the impact of clouds and aerosols on climate—the principal source of uncertainty in our current knowledge of evolving climate change.